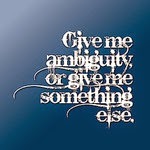 Can you tolerate an ambiguous ending? I think I can, as a rule. I watched a movie last week that had a pretty ambiguous ending, but it had enough context clues I could at least make some inferences about why the end needed to be ambiguous and what would or could potentially happen after the credits rolled. In fact, now that I think about it, I'm not sure the end was ambiguous at all. I think maybe it was just drawn that way, with the screenwriter/director giving enough information during the course of the film that the viewer really knew exactly what was going to happen. At any rate, though I was somewhat perplexed by this ending, it was not enough to make me angry with the filmmaker or make me feel I'd wasted my time watching the movie only to get no satisfaction. In fact, I felt deeply satisfied by this ending in spite of, or maybe even because of the ambiguity. So much so, I thought about it for days and keep thinking about it now and then. I picture the ending images and where I think they led -- but how they could have led somewhere completely different. I think of the metaphors involved in the setting and the last bit of action and how those things tied to earlier scenes. As a writer, this is something to chew on. If you write an ambiguous ending, are you attempting true "slice-of-life" fiction, where the reader is truly not meant to know (or maybe even care) what will happen after--the only intention is for the reader to take some meaning from what occurred during the time period in which the story was set. If so, you might want to be sure you're not setting the reader up for complete frustration when they come to the end. If they are left with the sense of What the bleep just happened?! and feel cheated by the lack of a clear ending, you might have a problem. It might mean you didn't deliver anything else meaningful in your slice. Perhaps a good way to envision this working well is to imagine yourself watching something interesting develop while you're riding a train or sitting in a cafe. You observe a certain person or set of people interacting and making decisions for a short period of time. You don't know what happens to them after you leave the cafe or after you get off the train, but you still feel as if you observed a meaningful moment, even if you don't completely understand the before and after of it. On the other hand, are you trying to write something that instructs the reader to bring her own thoughts and experiences and opinions to the table, that allows the reader to apply her own ending or at least the next step? In that case, it seems you would be wise to insert plenty of clues that could lead to various satisfying endings -- and by satisfying, I don't mean happy, necessarily. I mean simply that you've supplied your reader with enough information to make a few reasonable assumptions about what happens after the story ends and not leave them feeling like the film broke five minutes before the movie ended. Because we all know how much we hate that. What about you? Do you like ambiguous endings, or do you want things thoroughly concluded and finished off with a bow? What are some of your favorite novels or films with ambiguous endings? The movie I watched, by the way, is Take This Waltz, with Michelle Williams, Seth Rogin, Sarah Silverman, and Luke Kirby. Here's the trailer. As writers we want our words to have meaning, to be everlasting. Why else write them down? Why else seek publication? But what makes a memorable novel? Sometimes I’ll read a book – one I truly loved – and not remember many details, only that it touched me in some way. Less frequently I’ll read a novel, close the cover and want to reread it immediately. Or I'll think about the characters for days later, if not months and years. Wonder, not how the author accomplished this or that, but what those characters are doing now. As though they are flesh and blood, not ink on a page. Yann Martel’s Life of Pi stayed with me for years. I’m still haunted by Richard Parker, and by Pi’s message. Which story is easier to believe? I’ll never forget Vida Winter, her arthritic bejeweled fingers and black bangs, how she slowly unfurled the story of her tragic childhood to Margaret. And Margaret traipsing through the burned-out ruin of Vida’s childhood home. I won’t forget Frank McCourt’s miserable childhood, lice and all, Artemisia Gentileschi’s bound and mangled fingers, Harold Fry’s blistered and bloody feet, naïve Alma Whittaker’s discovery of the binding closet. 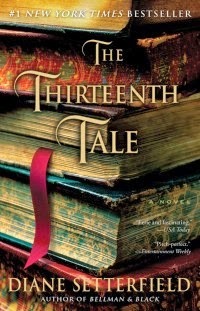 The quest to write a memorable novel haunts every author. I might have a good novel in me, I might have a thrilling novel in me. But do I have a memorable novel? How will my story tell a hundred years hence? I've been compiling books to deliver to the InternationalBook Project over the past few weeks. My dining room is stacked tall with cardboard boxes. For the past two years, every time I drive to Kentucky from Texas I fill my car with as many spines as I can, and this trip is no exception. After a mad rush of spring cleaning right before Easter, I decided to thin my own shelves as well, and I filled a box with book titles ranging from John Grisham's paperbacks to marketing and PR titles from my prior life in advertising sales. For a brief moment, I thought about the working life I had before leaping off the proverbial cliff to write full time and to obtain my MFA in Creative Writing. I didn't dwell on that prior life on that day last week, instead I tossed the books into a box and set them aside. Yesterday I shuffled and organized the books and one particular self-help type business book stood out to me. I couldn't remember buying it or reading it, yet there it was. I flipped it open to see the following inscription (in the photo below): April 24, 2005. Upon reading that date, I actually stepped away from the book. Nine years ago, to the day, exactly. Then I picked it back up and carried it to my patio to read it. Each chapter was designed with questions at the end, and 80% of the book was filled with my own notes. It was as if I'd opened a time machine. Nine years ago, my youngest daughter hadn't even started kindergarten, and right now she's planning for junior high (that put things in perspective!). I had a full-time job in advertising sales management, working fifty-hour weeks, striving for promotions and fruitlessly, endlessly seeking my boss's approval. The questions at chapter ends were designed to help the reader find a life purpose and mission. They were simple questions, yet I scribbled in the margins extensively, answering each probe as though my future depended on it. 3. When was the last time you took a risk in the direction of your dream? I'm afraid of myself—of "too much risk." How can I do what I want to do and take the time to write and be published and get it all done? … Then again, why am I so sure I am supposed to be writing? What am I supposed to write? … What is my direction? Maybe if I could figure it out I wouldn't be so scared. I long to write full time. I don't even know what that means—retreats, conferences, a community of writers? Workshops? Accountability as a writer? (terrifying) Publishing a novel? (more terrifying) What is the answer here? If I wrote full time, I could be free. And yet I feel safe in my current world. I'm too afraid to branch out. Why am I scared of the words? I was surprised at my own thirty-three year old voice. In other entries I wrote about feeling rudderless, about having no purpose other than going to work every day and being a mom (both important purposes, I'm not diminishing those roles in any way). From these entries, it appears quite clear that nine years ago I was seeking some sort of permission from myself to pursue my calling. And I was terrified of writing. And here I am now, following my purpose in delivering books to my favorite non-profit. Following my dreams of being a writer by finalizing the third draft of my novel. Yesterday, I talked to my agent-- a relationship I would never have dreamed of having nine years ago. In June, I'm returning for my second residency with my MFA program, and I'm planning creative writing workshops-- to teach, not to attend-- for the fall. What if nine years ago I'd given in to my own fears, and I'd never carved out those late nights to begin the painful (very painful) first steps toward writing a novel? What if I'd let the terrifying thought of leaving my career enslave me? Would I be sitting on my beautiful patio with a bouquet of fresh-cut flowers, a cup of coffee, and sleeping dogs on my toes, or would I be in an office, making split-second decisions, and hiring and firing, all while daydreaming of a writing life? Thinking about those questions prompted me to write a letter from myself at fifty to the me sitting right here, right now. She's the same me from nine years ago (although a lot less fearful). I'm still not where I want to be as a writer. My mission is still in progress. So what is the best advice I can give myself? Here's a small snippet of that letter. It's all going to work out. Keep writing. Don't stop writing because you face rejection or disappointments or are getting older—you'll still get older, anyway. Embrace getting older. Love your face and lungs and legs and hands. Love your words. Love your work. Be hopeful about the future. Take care of your health. Look forward to all the love in your life. Keep writing and keep following your passions and your purpose. And don't ever, ever give up. And so I'm passing this on to you, just in case you are the fearful me from 2005. Or maybe you're where I am now, in the middle and on the cusp of bigger things. Maybe you are the fifty-year-old writer looking forward to your next decade of your writing life and looking back on your success. I certainly don't have any answers about how to do it, this writing life thing. I have a lot less money now than I did back then, but I'd like to think I'm on the right road to gaining far more than I ever dreamed. Okay, here's the deal. In a key plot point in my WIP, the main characters take a weekend trip and it's a turning point for them both. It's not really a vacation, but rather a particular kind of trip, with elements that spur the storyline. The thing is, it's not a trip I've taken myself. In other words, I mostly made it up. And yet. Rooting around online today (we're going to call it "research" despite the fact that this scene was written months ago and is on its fourth or fifth draft), I found precisely the kind of trip my characters take, available close by. Next month. Should I go? On one hand, that's kind of the job of the novelist, making stuff up. I read The Known World by Edward P. Jones about seven or eight years ago and was absolutely blown away by the fact that the guy invented his entire slave saga, right down to the very authentic-seeming inventory kept by the plantation owner. On the other hand, Amy Tan admitted that she tried to convince her accountant husband that she should be able to write off Chinese restaurant meals as research, since her characters were eating in such locales. (And she had cravings, the fact of which apparently made no difference to his negative response.) So which? I guess I'd say both. Yes, as writers, it's our job to make stuff up. But it's also imperative that when we do, we get it right. I was nineteen when I read One Hundred Years of Solitude by the late great Gabriel Garcia Marquez, and all these years later I still remember being floored by the fact that he had me believing in the world he created, as though it were sociological fact, even as his characters sailed through the air on flying carpets. Aimee Bender, too, had me convinced that her character could indeed taste emotion in food, and that the girl's brother could do something more amazing yet in The Particular Sadness of Lemon Cake. 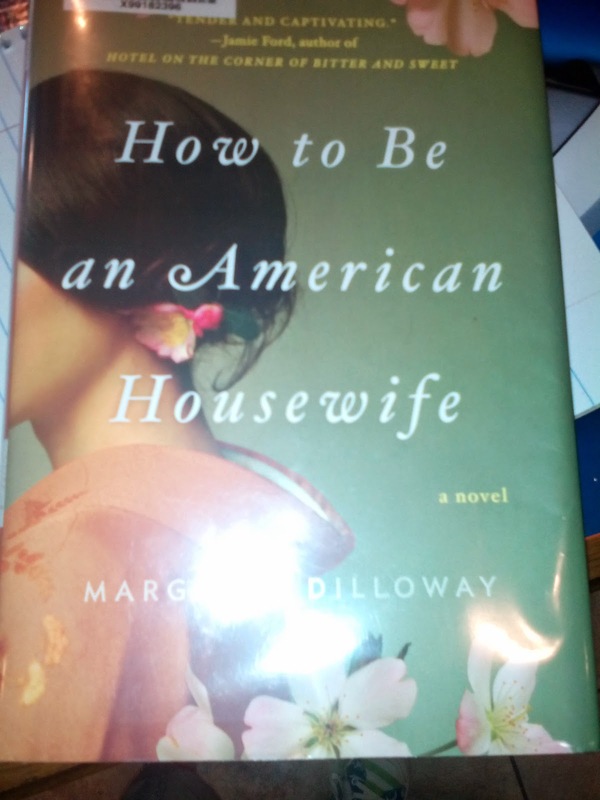 That said, as I read Margaret Dilloway's How to Be an American Housewife a few days ago, I appreciated the fact that her own life had informed the story, and the personal family history she provided in the author's notes lent credibility to an already believable story. The particular events of the trip my characters take were touted on a website I found this morning. Not just close, but precisely. I'd written that a class unexpectedly had a specific theme, and the identical words were used to describe a class offering on a weekend retreat here in Texas. Less than two hours from home. Next month. And affordable. Is it possible the universe is trying to tell me something? I read an article the other day that offered up some pretty grim news for us writers. Assuming you sit while you write and haven't sprung for a treadmill desk, you likely spend extended hours a day in a chair, pounding away at the keyboard. Unfortunately, you're putting yourself at risk for not only obesity, cardiovascular disease and diabetes but also certain types of cancer. Because I don't want you to die before you're at least 100 and have written every word you wanted to pen to page, here are some tips for helping you stay healthy as you write. Avoid candy, chips and crackers and instead reach for healthful snacks such as nuts, raisins, edamame, berries, yogurt, bananas, carrots, light string cheese, granola, etc. I'll admit to keeping a tall glass of green tea within reach nearly every waking moment. It's actually a step in the right direction from the black tea I used to drink. At least my teeth stay whiter. Today I'll begin in earnest to alternate a glass of water with my tea. If caffeine is your source of fuel—coffee, tea or, God forbid, RedBull—then make a commitment to drink more water. If hours go by before you get up and move around, then set a timer to go off at least every hour and get up and move around. Walk around the block, eat lunch while standing, do some yoga stretches. You don't have to clock a 6-minute mile to improve your health, but get up and get the blood flowing. If you're so inclined (and you have a fat advance on your book), you can always spring for that treadmill desk. I'm sure they're wonderful if you're a boss at walking and typing. I'm going to stick to regular stretching, eating lunch while standing and taking the dog for walks around the block. If you're trying to finish a book, searching for an agent, vying for time to devote to your writing or wrestling with ideas for your next project, I feel your stress. 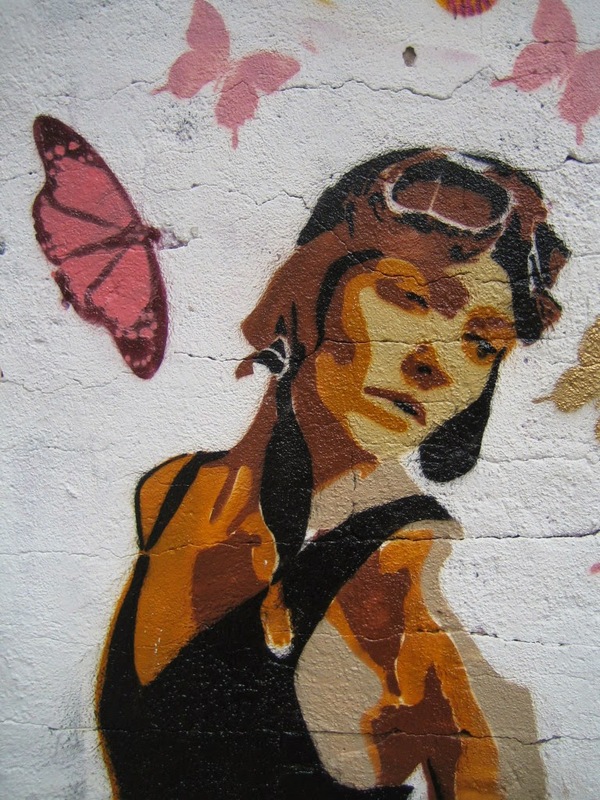 I give 100 percent credit to the five women on this blog for why I still write. While friends and family members can be a great source of encouragement, only a fellow writer truly understands why you write and can empathize when the going gets rough. If you don't currently belong to a writing group, then look for one at your local library or book seller. Draw inspiration from an online group if a local one doesn't fit your schedule. Don't fret if the first group you find doesn't work for you. Keep looking. At the very least, join or start a book club to learn what your peers look for in a good book. If you smoke, please stop. If you drink more than you can readily admit, curb your urge. If you engage in any other behavior that inhibits your joy, your creative fire, your passionate you, find a way to quit. We want you to do whatever it takes to produce your best work for many years. Volunteering not only forces you to get your mind away from you and your current project, but it also has been shown to lower your blood pressure and reduce stress. About a year and a half ago, I started a book club at a retirement home. This has allowed me to share my love of books, while giving me so much joy to spend a couple hours each month with incredible women with a wealth of life experience. It's also helped fill a hole in my heart that came last November when I lost my mom. Joan has taught ESL, served as treasurer of Writers' Guild of Texas and volunteered at her son's school as well as sponsored his artistic endeavors at college. She also supports the Parent Encouragement Program. Elizabeth has long volunteered at her children's schools. She especially enjoys directly supporting teachers with the unexpected. She also worked with an organization that provides dental care to at-risk children. Susan's work with International Book Project has helped ship books to orphans in Ghana and to nuns and monks in Nigeria. She's also busy putting together a prison literacy program in her home state of Kentucky while collecting books to distribute to at-risk families in eastern Kentucky. Kim volunteers at her daughters' dance studio—particularly during Nutcracker. She loves watching not only her girls but the other children she's seen grow and develop as dancers over the last few years. Seeing others pursue their passions inspires her to pursue her own. Julie, after selling Calling Me Home, was able to donate a portion of the proceeds to an organization that serves at-risk youth and, by virtue of that, help single parents, too. She also had the opportunity to visit with English classes at her high school in Denver—an inner city school that has struggled to stay afloat for years—and participate in some literacy fundraisers. We all attend as many author book events as possible—not only because it gives us a chance to get together while drawing inspiration from talented authors, but it also feels good to support our fellow writers. It's no secret that adults needs seven to eight hours of sleep each night. If you aren't getting your allotted amount, try to get more. Nap if you have an opportunity to. Your brain and your other organs need downtime to replenish themselves. Make sure you take care of you. 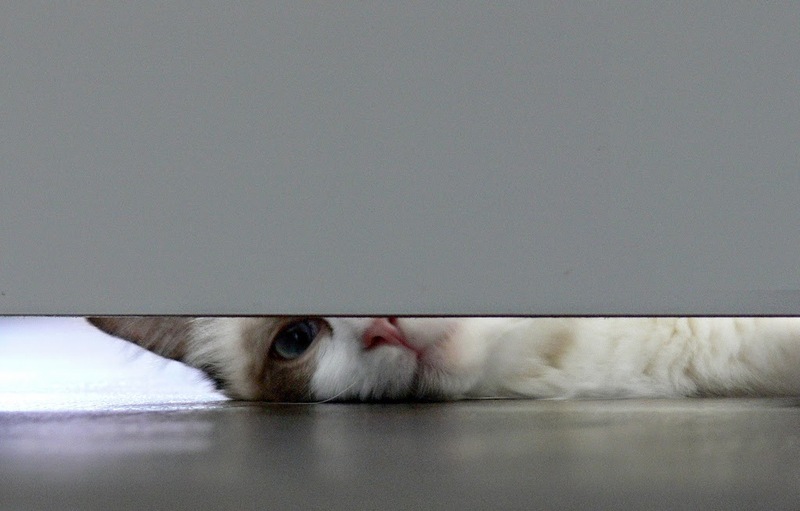 Image by Pacific Cat Ragdolls on flickr. What’s on Your To-Be-Read List? Every so often I make a vow not to buy any more books until I make a dent in my towering to-be-read pile. I may even keep it until I see a launch announcement from a favorite author, a recommendation from a friend who knows my taste, attend an author event, or give into the temptation to walk into a bookstore. One whiff of new book or, worse, OLD book smell and my credit card leaps from my wallet. Instead of checking myself into the nearest 12-step program, I’m going to give you a glimpse of my bookshelf, the one filled with stories yet to be devoured, and invite you to do the same. Admittedly, the cover seduced me first. A woman wears an expression like her world is about to end while she embraces a soldier. The Eiffel Tower looms in the background. The colors are faded, like a hand tinted historical photo. Paris. 1919. Secrets. Danger. Romance. My heart races just thinking about cracking open the cover to this one. A female British spy is trapped in WWII France and arrested by the Gestapo. Will she give up her mission or face a grisly execution? I don’t know about you, but I have to know! This is one of the few non-fiction selections on my shelf, but all of King’s art history books read like densely-rich novels and, well, exactly like he speaks in person. This is a good thing. It’s impossible to read anything by him without feeling both smarter and entertained. What can I say? I love Napoleon and Josephine enough to stick with them for 1000 pages. I know little about this book other than it takes place in WWII from the point of view of a nine-year-old who encounters a fence and becomes friends with a boy in striped pajamas on the other side. In other words, it will tear my heart out by the roots. So, what’s in your to-be-read stack? I’ve recently become addicted to George R.R. Martin’s phenomenally popular Game of Thrones. The fantasy saga features many kingdoms, cities, rulers and lands. 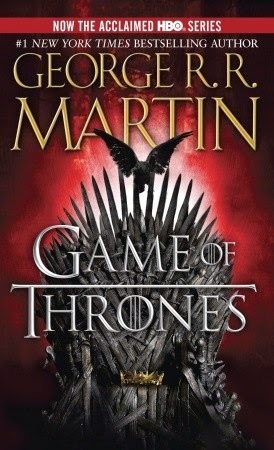 This series pits long-standing families against each other in a bid to put forth the one true King. The plot and characters are far too complicated to get into in just one post, but something that struck me is Martin’s use of House words, or mottoes. The family known as Stark are a cautious, practical bunch, wary of the pending dark times. Every move they make can be traced to their family words. The Lannisters are pompous, wealthy, conniving and manipulative. They lie, cheat and pay heaps of gold in exchange for power and safety. Children are schooled in these House words, so they grow up to know their enemies. 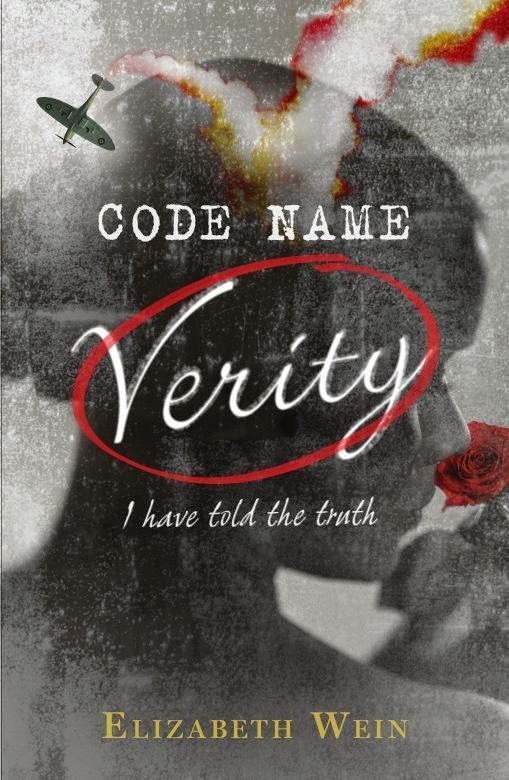 Just as a book has a theme, your character has a motto, whether you name it or not. If faced with an intruder, would your character draw a weapon, cower under the bed or offer all cash on hand in exchange for safety? If your character would fight a thief and an injustice, his motto might be that of House Martell: Unbowed, Unbent, Unbroken. Which motto guides your character’s every move, her every step toward the one thing she yearns for more than anything, or away from what she fears most. I’m midway through the first draft of my next book. It’s time I figure out my characters’ defining words. Think of your favorite characters. What are their mottoes? A man and his son were in an automobile accident. The father was killed instantly, and the boy was taken to a nearby hospital for treatment. After it was determined that the boy needed surgery, he was taken to the OR. The surgeon took one look at the patient and said, "I can't operate on him. He is my son." Before I reveal the answer, let's talk a bit about character. Often times we've heard characters referred to as cliched or stereotypical. The gay hairdresser/florist. The dumb jock. The blond cheerleader. The crooked politician. What's true about hobbies and professions can also apply to personalities. Not all mothers are loving. Not all old people are wise. Not all children are prodigies. Not all best friends are quirky. Be careful that you don't apply stock traits to your list of characters if you want them to be memorable. I'm pretty sure my generation (and any before mine) tends to be quicker to put people into categories than our children are. Play a little game with me. As you read through the list of professions, assign a gender to it--the first that comes to mind. (For fun, after you're finished, read the list to your child and see if he or she gets the same answers.) There's no crime in associating a certain gender with a particular profession. A lot of it likely has to do with your frame of reference. If every farmer you've ever met was male, then you'll naturally picture a man--probably wearing a pair of overalls and a John Deer cap--when someone says, "Hey, there's a farmer." But consider taking a character in your story--particularly one who isn't coming alive on the page for you--and making that person the opposite gender. You might find his or her personality explodes once you've changed genders. Just be careful about going against type to the point of being obtrusive. 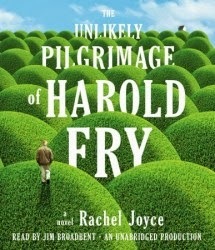 If your main character is a female pilot who falls in love with a male flight attendant, only to find he's dying of cancer, and his oncologist is female, his nurse is male and they have to postpone building their dream home, so their female architect is put on notice ... it might work or it might be a little jarring. As your reader gets younger, worrying about a character's gender should be less of an issue. For instance, my 10-year-old has a female dentist and a female pediatrician. Her dog's vet is female. Her fifth grade teacher is male (as was her fourth). Her principal is female. She doesn't assume gender like I do. My friend Maureen is a pilot and her son, when asked what he wanted to be when he grew up, said he really wanted to be a pilot but that was a girl's job. But if your reader is 30 or older, he or she likely has more preconceived notions about what to expect from characters. Take that into consideration and then decide how to make your characters come alive. Back to the riddle at the beginning of this post ... in case you haven't figured it out: When asked to operate on the boy, the surgeon said, "I can't operate on him. He is my son." The surgeon was his mother. 1) Work. "I need to work, so I can't focus on writing now." This is true—we do need to work. How about today when you take your lunch break you opt to eat outside? Bring a notebook with you and write for twenty minutes. If you can't muster up a few paragraphs, make some observations about your surroundings and write them down. They can be great prompts for later. 2) Facebook. "I'm just going to see the new baby pictures for my next door neighbor's daughter's third grader teacher's new grandbaby that was born in Alaska that I will never meet in real life. It will only take one minute." We all know this is not true. You will spend two hours on Facebook engaging in arguments and clicking "like" and chatting with a long lost friend. Please. Log off. 3) Important Things. "I've got to go the post office and the grocery and drop the dog at the vet. Did you not see my to-do list?" Yes. We all have Important Things. They all get done. But that doesn't mean you can't bring your computer with you. I've been known to edit or revise while sitting in the school parking lot, waiting to pick up a daughter at the end of her school day. Make your writing one of the Important Things, and it will get done. 4) Draw. "Oh, look. I could draw that bird." Or maybe that's just me? 5) Read. "I'll just finish this one chapter." That's a lie, but that's okay. I'll always say if I'm not writing, reading is the next best thing. 6) Clean. "It's Friday/springtime/dusty in here. I can't just sit and write with all of this clutter!" Write one sentence before you pick up that mop. Maybe the sentence will turn into a paragraph, maybe not. But one good sentence is better than none. Make deals with yourself, and stick to them. 7) Exercise. "But it's beautiful outside! I've been cooped up all winter! I need to run!" I can't fight you on that one…in fact, I'm a huge proponent of exercise as a great breeding ground for new ideas. Just make sure that you translate that thinking time to the page when you return. Focus your monkey mind and allow your creativity to flow while you sweat. Then write it all down. 8) Tend to Everyone Else. "I simply can't take the time for myself right now. Everyone else needs me." Well. Yes. At times, this is true. But have you ever heard a male writer say this? Not often. We women tend to quickly put the needs of others—children, aging parents, neighbors, even people we don't like—ahead of our own needs. And this also applies to viewing our writing time as a bonus rather than as a necessity. Write as though you have to. After all, don't you? 9) Wallow. "It's all crap anyway. There's no point." Oh wait, maybe this is just me. The only solution for wallowing is to write anyway. 10) Research. 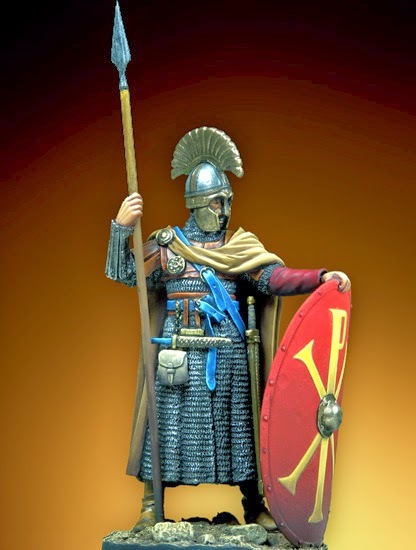 "I can't write this scene until I understand how a Byzantine soldier would navigate the streets of Constantinople in the year 1242." No. Just no. Research is a fabulous tool, and a necessary one. But don't allow it to usurp your writing time. Set a timer. Research for thirty minutes. And then write. The most important advice? Stick to it. Hold yourself accountable. And so for me, on this lovely warm spring day, I'm off to write on my patio, thankful for the words, opportunity, and time to do what I love. I suggest you do the same. Happy Friday! I wrote this review last year when The Promise published in the U.K. I've since met Ann in person. She is lovely, kind, and gracious -- and she can write up a storm. Literally, in this case. If you're in the DFW area, join Ann at her talk and signing at Barnes & Noble, Lincoln Park, Dallas, April 17, 2014 at 7:00 p.m. Some of the What Women Write crew is sure to be in attendance! I read Ann Weisgarber's The Personal History of Rachel Dupree in 2012, and was blown away by this intense, moving story. It was shortlisted for the Orange Award for New Writers and long-listed for the Orange Prize in the U.K., and was chosen for the ABA's Indie Next List and Barnes & Noble's Discover program when it released here in the States. I devoured it and couldn't wait to read something new from her. I read it over the holidays in whatever moments I could steal away from all the hullaballoo, and once again was startled and drawn in completely by this novel—most especially by the voices, exactly as I was with Rachel Dupree, a young African-American pioneer, in the previous novel. 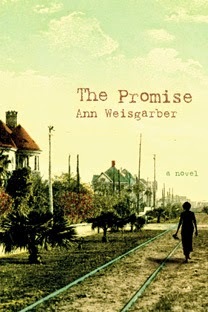 The Promise is the story of Catherine Wainwright, a pianist who flees her Ohio home in disgrace, impulsively accepting the proposal of the man who worshipped her from afar when they were young. Oscar Williams is still rough around the edges, but he's stronger and surer of what he wants than Catherine expected when she agreed to marry him. He lives far away in Galveston, Texas, where he has built a dairy farm on "the ridge" far "down the island." The Promise is also—and maybe more importantly—the story of Nan Ogden. Nan has been Oscar's housekeeper since his first wife died tragically. Upon Bernadette's death, Nan promised to always watch out for Andre, Bernadette and Oscar's only child. But there's more to her story: Nan harbors secret feelings for Oscar. The story alternates between the distinct voices of Catherine—refined and stunned by her new life—and Nan—practical, realistic, and completely unable to deny the pull of her promise and her feelings. It feels like a quiet story at first (intentional, I believe!). 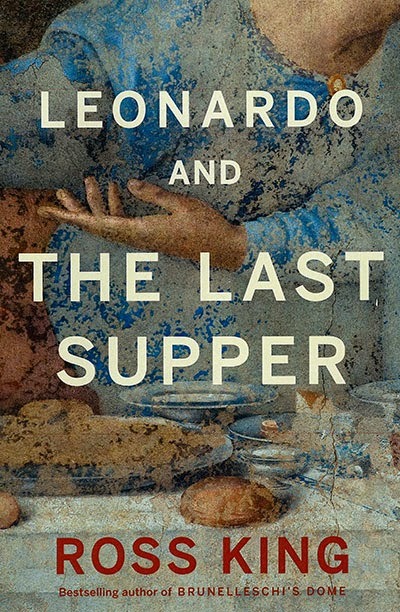 With careful and deliberate language and plotting, Weisgarber develops her characters through loaded interactions between Catherine and Oscar, Catherine and Nan, and Nan and Oscar, as well as Catherine's tentative struggle to become a mother to Andre. But then the story marches toward the historic 1900 Galveston storm, the worst natural disaster in twentieth century American history. By the time I arrived at the second half of the book, through the warning signs and eventual arrival of the hurricane, my heart literally pounded as I read of Oscar's attempts to secure his animals and home and the people for whom he feels responsible. I stopped stealing bits of time and had to demand the few hours I needed to finish reading The Promise and learn what its heart-wrenching conclusion would be. It's not an easy story to read (again, like The Personal History of Rachel Dupree). If you are easily frightened or like stories that tie up things with a pretty bow, you might not like it. But if you're like me—a reader entranced by realism, even when packaged in tragedy—you'll likely find it nearly impossible to tear yourself away from this story until you've finished, and then it will haunt you for days. I highly recommend The Promise. Last week the Fort Worth Library’s main branch presented an evening with author and long-distance hiker Jennifer Pharr Davis. My husband and I arrived early and wandered around the grand building, admiring local artwork in the atrium and finding our way downstairs to the stacks. Upstairs we found Susan and said our hellos, noticing a little girl toddling across the floor as if on a mission. Then we headed to the auditorium to see her mother speak. Jennifer is the owner and founder of Blue Ridge Hiking Company. Her adventures have been featured in The New York Times, The Washington Post and on NPR’s Talk of the Nation. She has appeared on national television shows such as CNN Headline News, Fox and Friends, the CBS Early Show and the 700 Club. Jennifer has been named Blue Ridge Outdoors Person of the Year and a National Geographic Adventurer of the year. 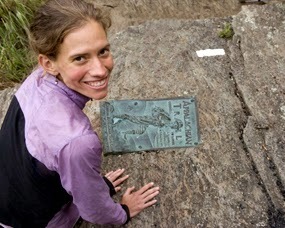 Her Appalachian Trail record was voted Ultrarunning Magazine’s Female Performance of 2011. In 2012, Jennifer was a National Geographic Adventurer of the year. She’s written two books about her journeys. 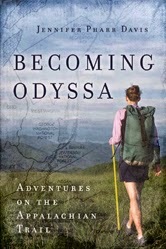 Called Again: A Story of Love and Triumph from her latest journey, and Becoming Odyssa, written after her first thru-hike. 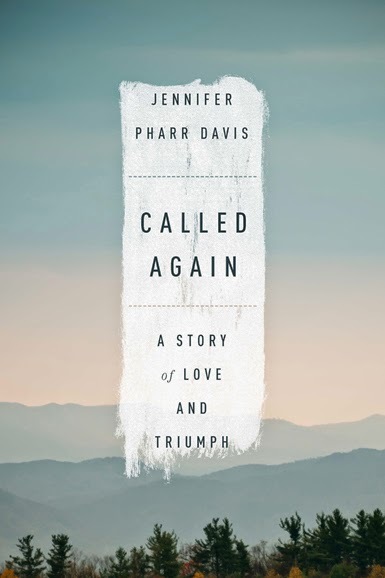 Her husband, Brew, wrote 46 Days: Keeping up with Jennifer Pharr Davis on the Appalachian Trail, where he shares his account of the trials, successes, joys, and frustrations of his wife’s journey on the Appalachian Trail. Jennifer thru-hiked the Appalachian Trail alone when she was just 21. She said she learned more on that trip than on any other, about herself and about her place in the world. She began to feel a part of nature. Despite being filthy and smelly, physically ravaged with cuts and scrapes and bruises, she learned to believe in her own beauty by seeing her reflection in others, rather than in a mirror. Hiking became more than a vacation agenda, it became her obsession. After ditching a desk job, she founded her own hiking company, BlueRidge Hiking. Since then she has logged over 12,000 miles on six different continents. In 2011, she thru-hiked the Appalachian trail in 46 days, 11 hours, and 20 minutes, reaching her goal to hike the entire 2,180-mile faster than the current overall speed record. The first woman to hold the overall title, she is now the overall record holder for both women and men. She read brief passages from her books and enthralled us with stories of bear sightings, trail magic and rough terrain. Then she treated us to a photo journey of some of her favorite spots in the world. Though the pictures were breathtaking, her journey was far from glamorous. On various trips she’s suffered frozen-shut eyes, dehydration and the beginnings of hypothermia. Once when asked by a fellow hiker if she was having fun, she said fun is easy. Fun can be had anytime. The satisfaction of pushing herself through unbelievable circumstances to attain a goal was far more rewarding than fun. On her record-breaking hike, her husband Brew partnered with her for trail support (he drove as she walked and met her at various stop points with supplies, food and encouragement.) She credits him as the reason she was able to finish the journey. At one point, she was going to give up. She had shin splints and near-hypothermia, once having to walk backward down a mountain because the pain in her legs was so severe. When she finally met up with Brew, he got her warm and dry and told her to give it one more day. If she still wanted to quit after that, they’d drive home together. He knew she needed to get back on the trail to see that she wouldn’t give up. That she couldn’t give up. After the talk her husband and darling daughter joined her on stage. Coordinating Jennifer's book tour with travel, they are on a mission to hike as a family in all 50 states. Their daughter toddled across the stage, purposeful and confident. I wonder where she learned that from? You can purchase her books directly from her website, Blue Ridge Hiking, or on Amazon, Barnes & Noble, Powell's and other indies.